We had a couple of really warm days here this past week. Temperatures hit 100 in the garage, with the attendant humidity. We were fitting tubes to the frame yesterday when I noticed for the first time that our shiny metal Locost had acquired a few light patches of dull tan. A quick swipe with a 3M finishing pad brought back the gleaming luster of the metal underneath, but the 3M pad didn't eradicate the notion that our pristine metal tubes have been exposed to the elements for more than a week now, completely free of any oil or protective coating of any kind. An oil-free surface is critical to weld quality. Any contaminants in the weld puddle, and the congealed metal that joins the two pieces will have the yield strength of frozen yogurt. So it's important to leave the tubes alone for now, just polishing them up a bit when they start to show a patina of orange or brown. 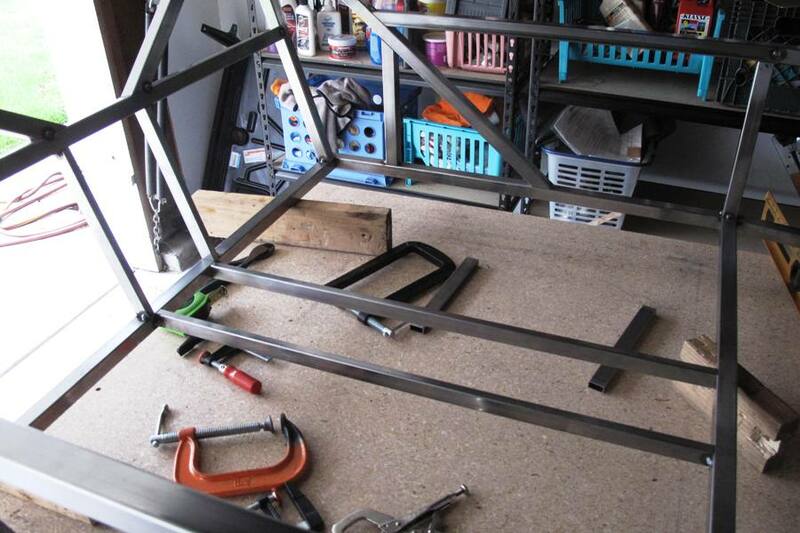 But the rush is on to get everything attached to the frame and fully welded, so that POR-15 or one of its cheaper rust-encapsulating competitors can be applied and we can finally relax. We know this is bothering you as much as it bothers us. Or not. 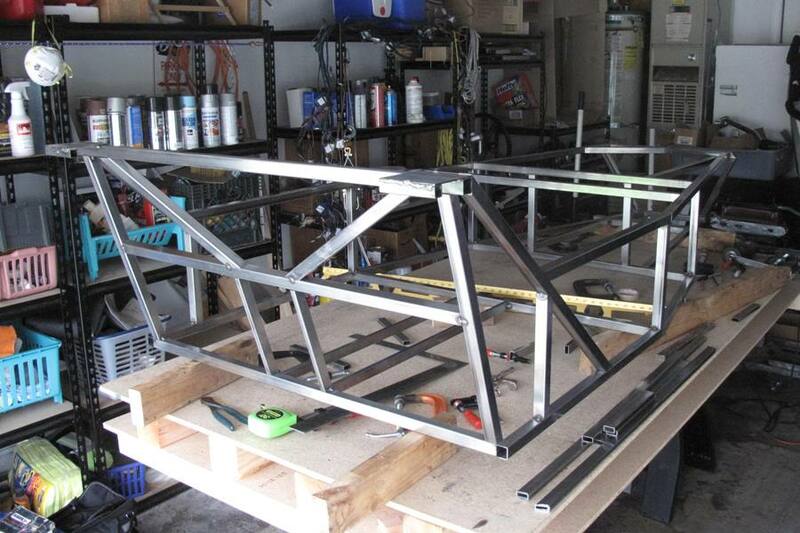 What's left to do on the basic frame is the transmission tunnel and the rear overhang. We're doing the overhang last because it'll get in the way of building the transmission tunnel, and it has round tubes, some of which need to be bent in a neat and presentable manner, which we suspect may not go all that well. We'll experiment with the wood bending method and report back. We need to get good measurements on the practice bends, since the real trick will not be getting the tubes to bend, but putting two 90 degree bends in a tube and ending up with the sides exactly 42" apart. For the transmission tunnel, we still need to cut a few tubes. Okay, most of them. Yes I know, we claimed for months that all of the frame tubes were cut, but in our defense we didn't want to cut a lot of transmission tubes until we were sure what the dimensions of the tunnel would be. As it turns out we're still not a hundred percent sure, but we're going with 11 inches high and 5 inches wide, which is huge, because you can't be too careful. If the gearbox and driveshaft still don't fit, we have hammers. You may have heard us mention that before. 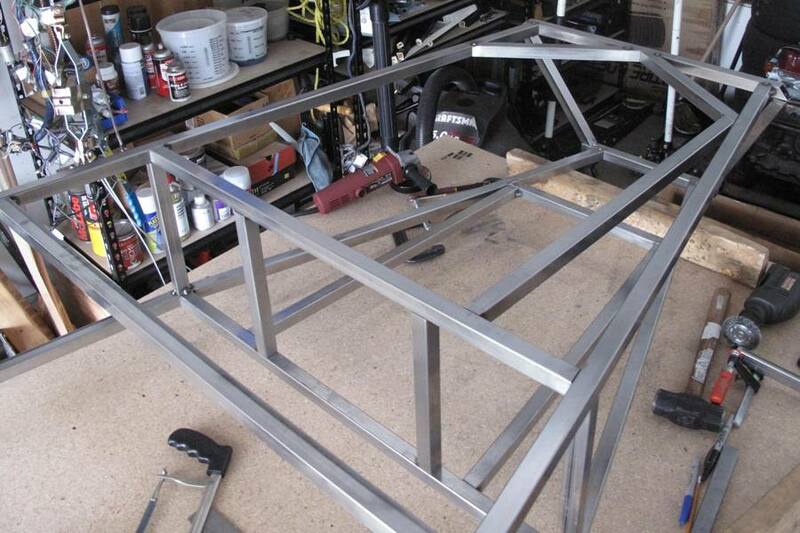 After the transmission tunnel and the rear tubes, completing the frame will be all about attaching brackets. We have just about everything we need for that, and by "have" I mean we know how to make them. The only thing that might be a problem is the steering rack mount. We need to get the rack shortened before we can figure out exactly where to mount it. We know what's involved in shortening the rack, but it's not something we want to tackle with our meager skills and meagerer 110V MIG welder. We need to find that perfect machine shop, the one where that former race car constructor works. You know, the guy who worked for Roger Penske. Or McLaren. That one. Woah! I’m really loving the tepemate/thlme of this site. It’s simple, yet effective. A lot of times it’s difficult to get that “perfect balance” between superb usability and visual appeal. I must say you have done a excellent job with this. Additionally, the blog loads super quick for me on Safari. Excellent Blog!